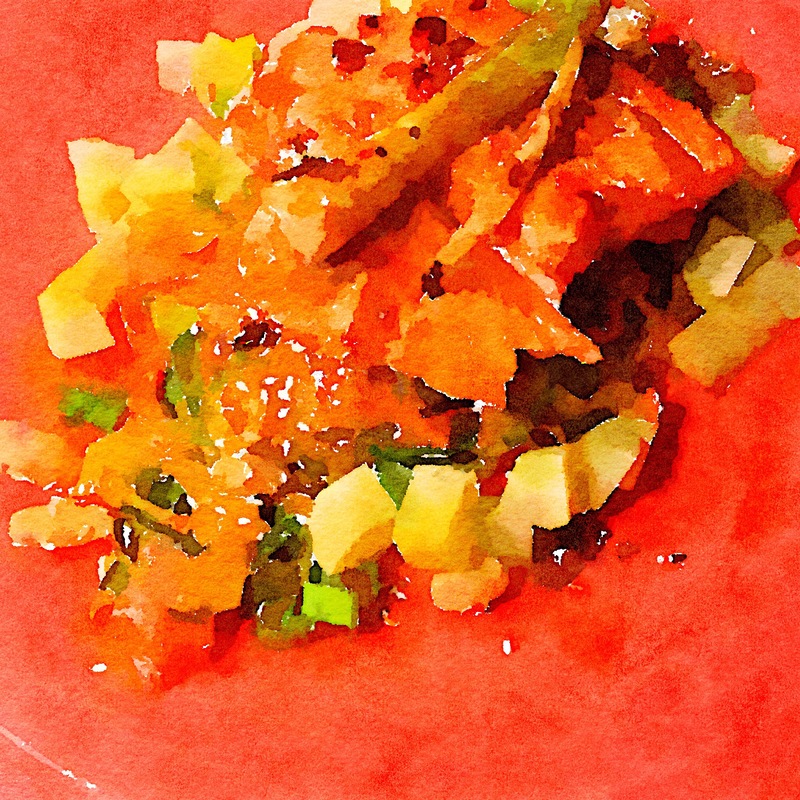 There was more kohlrabi this week. I probably don’t despise this poor, water-chestnut-type tuber thing as much as I think I do, but I have been filled with commuter rage all week and whatever patience I once held to, tenuously, has long since been squeezed to nothingness in my clenched fists. I chucked the kohlrabi into the compost bin, hard enough to knock it over. And of course, the kitten went to town in her new playground of coffee grounds, broken eggshells, and disgusting vegetables that look like toy cat balls with legs. Tuesday night, he made a veggie-licious dinner. He grated all four of the zucchini into long, wide noodles, along with a pair of carrots from the crisper drawer, and tossed them with a spicy-sweet peanut sauce and white sesame seeds, then arranged them on a plate with a little quick-pickled cucumber along the side. 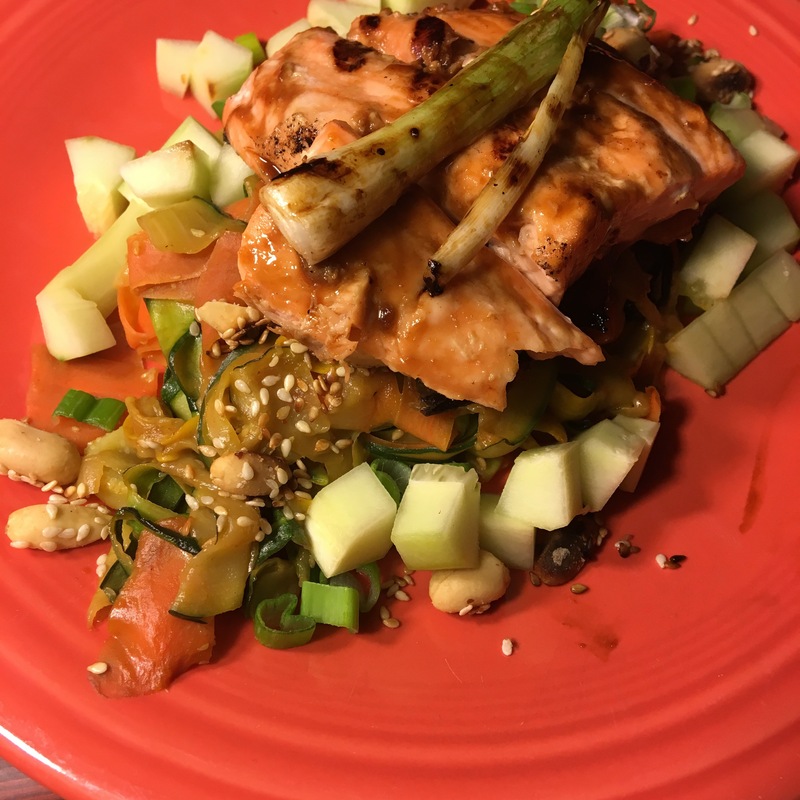 For the protein, he laid a gorgeous piece of salmon on top, and topped it with another of the spring onions from last week’s share, which he split lengthwise; both were basted with Hoisin sauce. Quarter 4 cups of strawberries. In a large glass or ceramic mixing bowl, combine them with 1 cup of finely chopped rhubarb and 2 cups of sugar, stirring well to distribute the sugar evenly. Cover the bowl and let sit, stirring occasionally. Pour the mixed fruit into a pot and place it over medium-high heat until the liquid released by the fruit begins to boil. Stir in 1/4 cup of lemon juice and let the mixture return to a boil. At that point, set a timer for 5 minutes and stir continuously, adjusting the heat to keep the temperature high without allowing it to boil over. When the timer beeps, cover the pot, remove it from the heat, and let it sit. Set the pot back on the stove over medium-high heat and bring it to a rolling boil. Set a timer for five minutes and stir continuously. When the timer beeps, ladle the jam into sterilized jars and process in a hot water bath for 10 minutes. Yield: 5 scant half-pint jars, if your husband sneaks some of the fruit out of the pot between boils, to make a dessert sauce. Tonight’s dinner will be burritos (scratch that: burrito bowls, since the tortillas are past edible), made with last week’s lettuce; pulled-chicken and -pork leftovers from last night’s BBQ dinner out, combined with a few bites of skirt steak from earlier in the week; fresh avocado; and a salsa that’s about to be put together from two ears of roasted corn (nearly forgotten in the crisper), a roasted bell pepper, a roasted jalapeno pepper, the last spring onion, a small handful of chopped cherry tomatoes, and a small lime. By the way, it turns out he likes the bok choi after all–at least when it’s been sauteed with a little olive oil and a bit more of the Hoisin sauce, and tossed with a little leftover rice, and maybe a little leftover turkey. 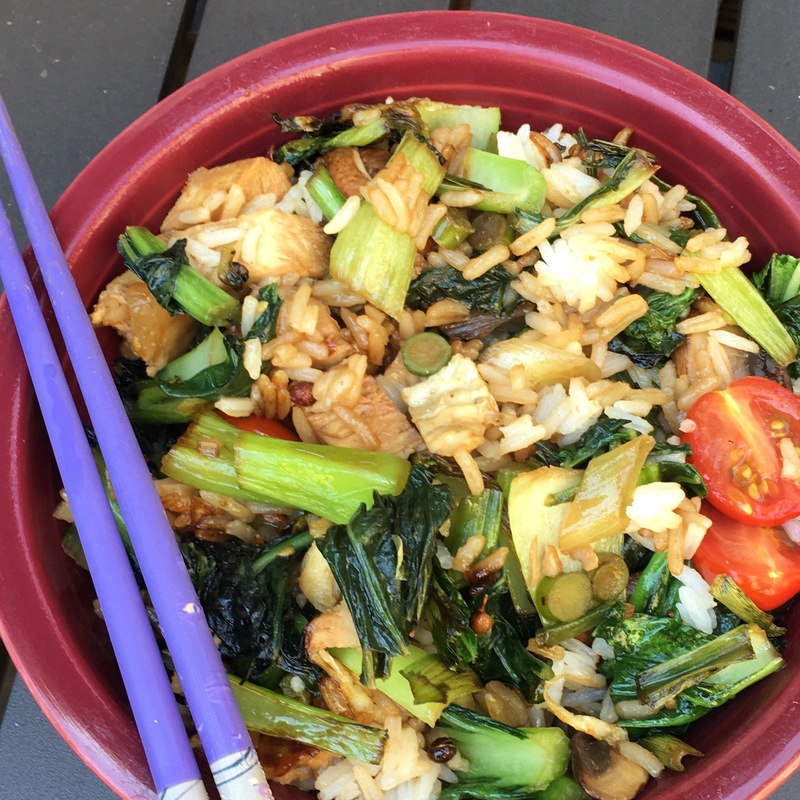 We still haven’t figured out what to do with kohlrabi, but bok choi definitely gets a star at lunchtime.